Hi again! Did I tell you on Tuesday I was going to be back with another design? Because here I am! I’m a part of a Crochet Charity Drive on Facebook that is hosted by Blackstone Designs. She got together a bunch of designers to make fun little amis for donations. I wanted to design something fun and different for me. I’ve done owls in the past but I wanted to do something different for this pattern… and I love pizza. It’s one of my favorite food groups. Don’t challenge me on this, pizza is a food group. 😀 I’ve written two different pizza toppings for you, so you can pick pepperoni or veggie and make yourself a couple cute lil pillows. Mine are on my couch right now. I like them, if I do say so myself. 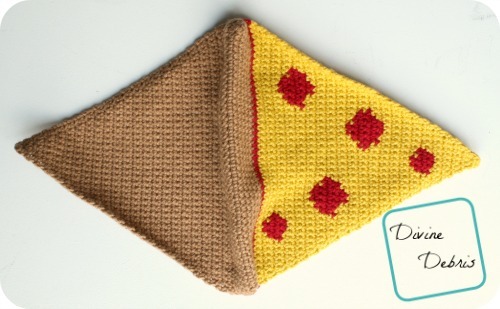 This pattern is worked from the crust to the point of the pizza. The crust is worked in the round, with a slip st into the first st from the last and the triangle parts are worked back and forth, separately, until you slip stitch the edges closed and stuff it (photo example by the crust instructions). All of the stitches in this pattern are single crochets, because of this the triangle portion (where all the color changes are) only tells you how many stitches to do in what color, this is what the number in the parentheses means. The bottom crust is the same for both pizza designs. 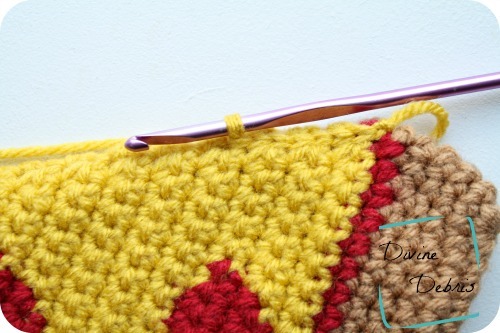 Fold your crust in half and using stitch markers, mark the 44 scs on the front of the piece. 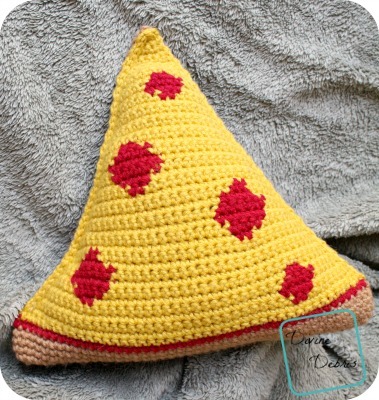 Every stitch in this section of the pizza ami is a single crochet, because of this the directions will only tell you what color (ie: Color A, Color B, etc…) and the number in the parentheses tells you how many single crochets to make. Using bobbins is suggested for this section. Color B is red, color C is yellow, color D is black, color E is green, and color F is white. The instructions below do not tell you when you fasten off between colors, do that at your own discretion. Color B is red and color C is yellow for this section. Lay your top triangle (pepperoni or veggie) on top of the crust and line up the edges. Create a slip knot on your hook and slip st the two row ends together (example above) or seam it closed in your preferred method of seaming. Go most of the way around before you stuff the piece, but be sure to stuff the ami before you close it all the way up. Tada! I hope you love these pizza amis as much as I do. I just think they’re silly but super fun and a great way to use tapestry crochet. Awesome pillow! 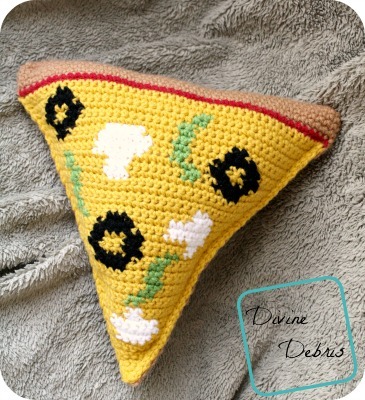 I love crochet food projects! So fun! 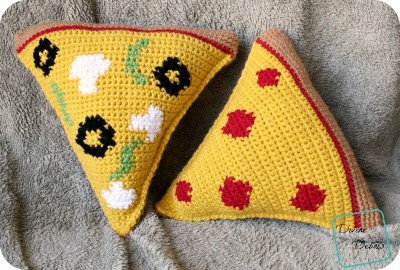 I am a lover of food themed crochet projects, and a self proclaimed ‘pizza addict’ so this pattern is a double win. Can’t wait to make 1 of each, thank you for sharing!